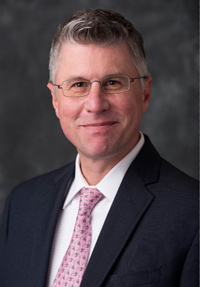 Dane Chetkovich, MD, PhD, professor of Neurology and director of the Medical Scientist Training Program, will be chair of Neurology at Vanderbilt University Medical Center. Dane Chetkovich, MD, PhD, professor of Neurology in the Division of Neurophysiology/Epilepsy, and director of the Medical Scientist Training Program (MSTP), has accepted a leadership role at Vanderbilt University Medical Center, as chair of the Department of Neurology. Beginning September 1, Chetkovich will lead Vanderbilt’s nationally ranked department, which includes 16 clinical divisions, more than 80 faculty members, and more than 40 residents and fellows. The university is ranked 14th in the nation among research-oriented medical schools by U.S. News & World Report. Vanderbilt is also among the top 10 medical schools in funding from the National Institutes of Health (NIH). Chetkovich, also a professor of Physiology, joined Feinberg’s faculty in 2002. He has since served as both an active clinician and a principal investigator on multiple NIH grants, with a research focus on the role of excitability-regulating ion channels in the context of normal physiology and neuropsychiatric disease. In 2011, he was named director of the MSTP, where he has been key to the training and success of Feinberg’s MD/PhD students. Chetkovich earned his medical degree and doctoral degree from Baylor College of Medicine in Houston in 1994. After completing an internship at Baylor, Chetkovich joined the University of California, San Francisco, where he served as chief resident in neurology and later completed a postdoctoral fellowship. During his time at Feinberg, he received numerous awards, including the John A. Kessler Teaching Award in 2016 and Neurology Resident Teaching Award in 2015. In 2011, he received the Derek Denny-Brown Young Neurological Scholar Award from the American Neurological Association. His research has frequently been published in top peer-reviewed journals, including Nature, Molecular Psychiatry and Proceedings of the National Academy of Sciences. In 2016, he published research that demonstrated how manipulating a novel target in the brain using gene therapy could lead to new treatments for depression. Among his many national research committees and activities, Chetkovich is on the editorial board for Epilepsy Currents and the American Board of Psychiatry and Neurology committee responsible for writing the board-certification exam for neurologists.